We offer a wide variety of landscaping services all year round from constructing and maintaining your landscape to snow removal services. Our knowledgeable and creative designers will create a landscape design layout of your outdoor living space with hardscaping, such as brick pavers and retaining walls, blended with plantings and plant selections to produce a stunning landscape for your home. This design is the guide by which our installation crews create the final product. When it come to enhancing the curb appeal of your home, drives and walkways of brick pavers can make your home shine! 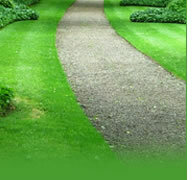 For durability and beauty we use Paverlock and Oakspavers products. "When we were deciding on a deck we were only thinking about "Wood or Synthetic". We never thought of a paver deck! Doan's gave us the idea. Plus they came in on time, on budget, and their workers were very professional. We've gotten great use out of it and have received a ton of compliments." Mortarless construction with special reinforcement and pinning allows our walls to remain flexible during freeze/thaw cycles--ensuring long-lasting performance against harsh elements and requiring almost no upkeep. Read more on our retaining wall installation techniques. Whether you are looking to accent your lawn and landscape beds or retain a hillside, boulders can be a natural enhancement. Commercial contracts with 24 hr service that include salting and sidewalks. Site can be inspected to insure the safest conditions are maintained. Financing	available through John Deere Credit!